Incline senior Elyse Kirkland will lead the Lady Highlanders into the postseason with a quarterfinal matchup against Battle Mountain on Friday, Nov. 3 at 3 p.m. in Fernley. The Incline girls’ soccer and volleyball teams concluded their seasons last week, and each are now gearing up to play in regional tournaments with hopes of capturing a state bid. The Incline volleyball team finished the year at 11-3 in Class 2A Northern League play for a second-place tie with White Pine in the standings. But because of the Nevada Interscholastic Activities Association tiebreaker rules, the Highlanders were forced to settle for third place, and will now face Battle Mountain in the quarterfinals of the Class 2A Northern League Girls Volleyball Championship. 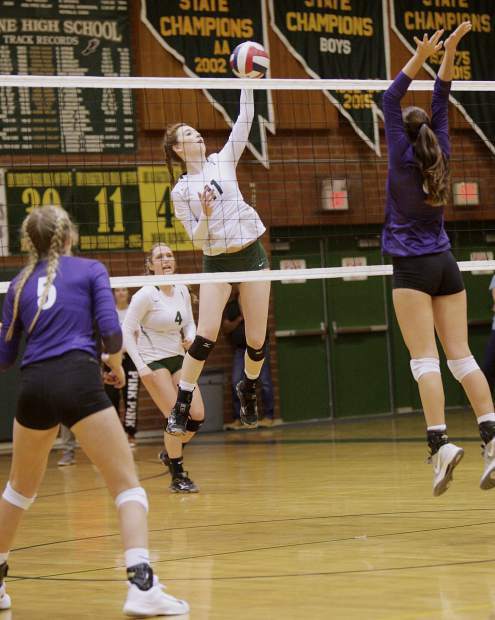 Incline took on Battle Mountain and Pershing County last weekend to close out the regular season, and according to Head Coach Tim Kelly, ended the year with some of the best volleyball the team has played. The Incline coach pointed to the leadership of his three senior captains, Ellyse Kirkland, Madeleine Saxe, and Madison Cronk as a big reason for the team’s success this season. He also praised the improved play of the team’s interior in senior Alexis Krolick and sophomore Michaela Racich. The Highlanders’ matchup with Battle Mountain will take place on Friday, Nov. 3, at 6:45 p.m. at Fernley High School. Incline won both of the regular season meetings between the teams in straight sets, and if they are able to reach the semifinal round they will take on White Pine in a game for one of the Northern League’s two playoff bids. White Pine and Incline split two very closely contested matches earlier in the year. “We feel like we handed one to them when we played at White Pine. That’s how we lost the tiebreaker, they beat us in four at White Pine and we beat them in five at our place. We know we can beat White Pine and get another shot at Yerington for a regional title. We need everyone to Fernley on Saturday at 1:45 (p.m.) for our regional semifinal,” Kelly said. The Incline girls’ soccer team concluded their regular season with a pair of wins last week to finish fourth in the league standings at 8-5-3. Incline (8-5-3, 8-5-3 Northern League) will next face rival North Tahoe in the opening round of the Class 3A Northern League Girls Soccer Championship on Thursday, Nov. 2, at Lowry High School in Winnemucca, Nev.
North Tahoe (14-3-1, 12-3-1 Northern League) has been a problem for most every team in the league this year, but the Highlanders have had success against the Lakers, forcing a 1-1 tie early on in the year. North Tahoe then defeated Incline 3-0 in their final matchup of the regular season. The Incline cross-country team competed at Shadow Mountain Park in Sparks, Nev., on Friday, Oct. 27, for the Northern 2A/1A Regional Championships and finished in fourth place out of five teams. The Highlanders boys tallied 64 points, but were edged out of one of the Northern Region’s three state meet bids by Jackpot, who finished with 53 points. North Tahoe won the meet with a low score of 23. Still, Incline freshman Niklas Pietzke’s fifth-place finish with a time of 18 minutes, 18 seconds, was good enough to earn the Highlanders runner an individual qualifying spot for the state championships. Freshman Zach Homola was Incline’s next fastest runner at the meet, finishing with a time of 21:10 for 22nd place. Junior Dillon Jenkins then came in at 23:05 for 27th place, followed by junior Brent Wolf with a time of 23:11. Senior Kate Rye was the girls’ only representative at the regional meet. She finished with a time of 25:16 for 13th place. Pietzke along with the rest of Nevada’s top cross-country runners will return to Shadow Mountain Park for the state championships on Saturday, Nov. 4. The Class 2A/1A boys’ race will begin at 11 a.m.